I suppose my favorite time of the year is now over with the end of fall and the celebration of Thanksgiving yesterday. I hope everyone had a wonderful Thanksgiving; ours was a small gathering this year, but it was full of love and good food! Now it's time to turn all my pumpkins into puree and bring out the Christmas tree. Christmas is my second favorite time of the year and it means that it is now the season of cookies! That's a season I can get behind. Actually, I love a lot of things about the Christmas season - snow, lighted homes, carols, eggnog, Christmas trees... I just don't love the creeping of Christmas earlier and earlier each year and the focus on gifts and spending tons of money. This year I was at a store in early October glancing through some Halloween goodies and they were already putting up Christmas decorations in the last aisle of seasonal items. You can't turn on the television without being bombarded with Christmas commercials for buying gifts - starting as earlier as the beginning of November now (we actually saw some the week of Halloween). I'm a big fan of seasons and enjoying each time of year for what it is - not rushing to the next one. So this year I'm going to try to have a simple holiday season. It will still contain a plethora of homemade holiday treats as I love to give them for gifts and have them for gatherings. These cookies aren't a traditional Christmas cookie and can be made anytime of the year, but I like their hint of spiciness in the cold weather. If you've ever had a cup of Mexican hot chocolate, you know what I'm talking about - chocolaty, slightly sweet, with a bit of cinnamon and a touch of cayenne pepper - not enough to make them hot, but just enough to give them a touch of warmth. 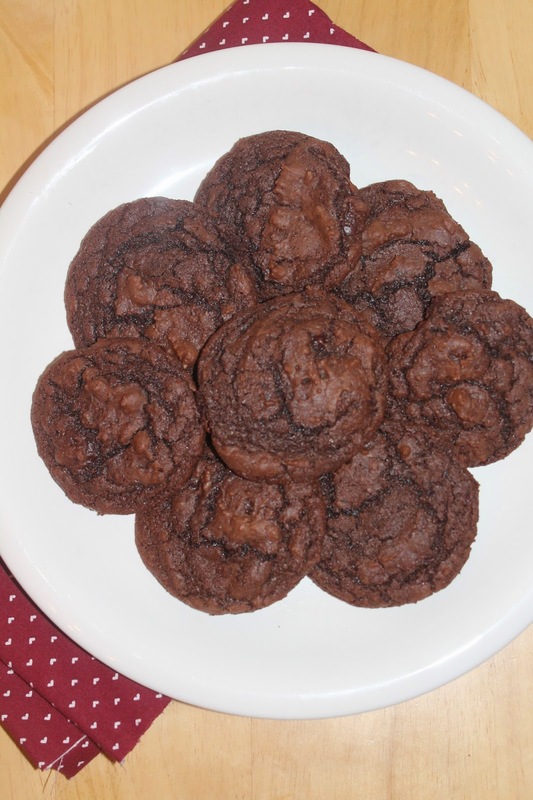 They are similar to these Mexican brownies that we love. This recipe will make about 30 cookies. Granola is a staple in our household, though usually it's in bar form (I need to update that recipe as I've made many changes over the years, especially in reducing the sugar). We make granola bars almost every Sunday for our weekday breakfast. Every once in a while though, I crave granola cereal with cool creamy milk. It's usually happens around this time of year when there's pumpkin puree around because that's how I almost always make it. I love granola that is full of spices. It fills your home with wonderful aroma as it bakes. 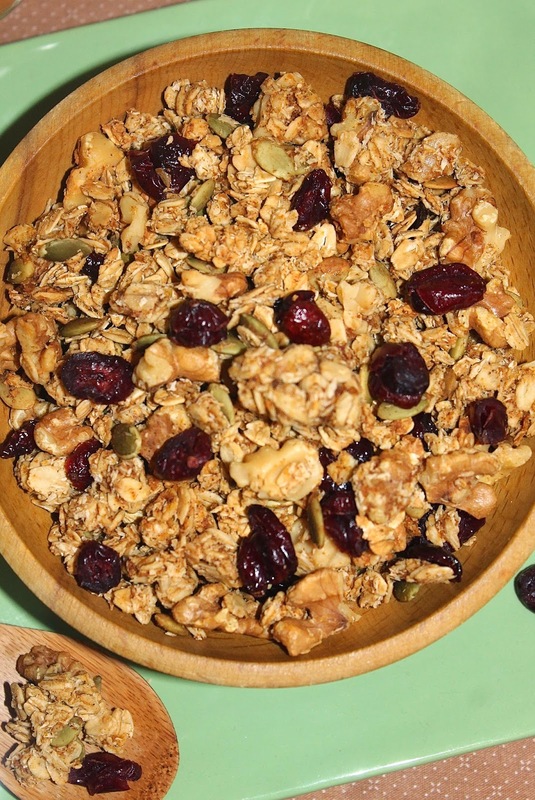 You can eat this granola just as is, but I like to eat it as cereal or with plain yogurt. 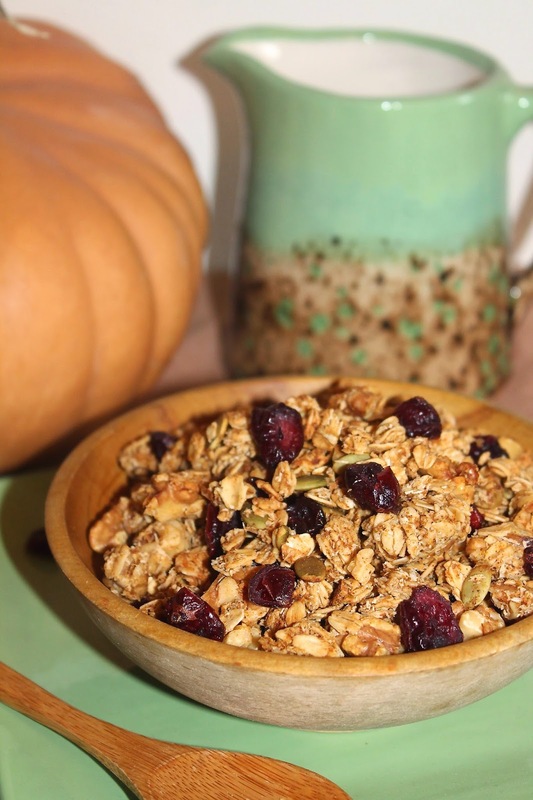 I wanted to have it around for Thanksgiving week for quick, nutritious breakfasts that make me think fall! 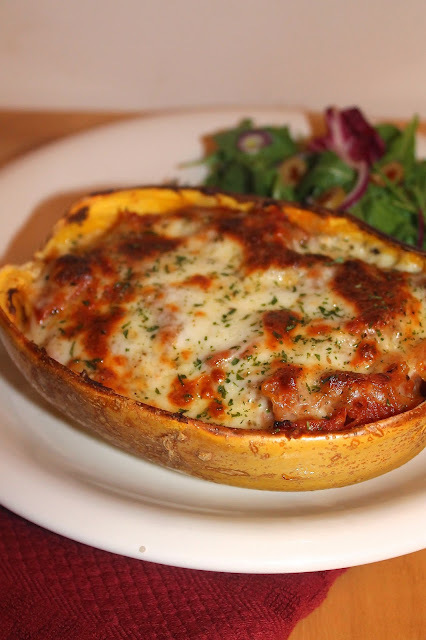 Plus, it's a perfect recipe for Week 4 of 12 Weeks of Winter Squash! On a side note, it seems that the manual focus is working better on my camera, so I'm getting decent photos again now (autofocus is still toast). I love the little pitcher in this photo. My Grandmother made it and the matching plates in her ceramics class! I'll be starting all my posts off now with the bad photo apology as I'm still dealing with camera issues.... But, I couldn't let the opportunity to post this bread recipe during apple season slip by - this quick bread is too delicious to not share. It's like a slice of autumn. I've been making it to serve along side of soups like cream of cauliflower and split pea now that it is getting cold here. 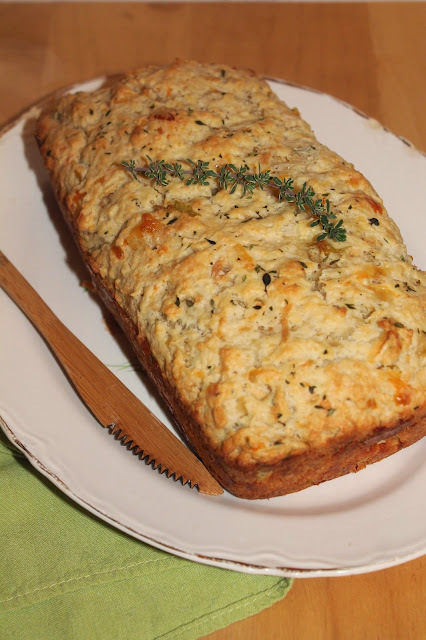 This bread has a lovely sweet and savory flavor combination with pretty flecks of apple and thyme throughout the loaf and in each slice. It creates a wonderful fall aroma in your home while it bakes. My ten-year old cousin and my mom loved it when we had them over for dinner recently. I think it would be a great Thanksgiving dinner bread as the flavors compliment turkey and fall vegetables very nicely. I adapted this recipe from this one over at Gimme Some Oven. This recipe will make one 9" loaf of quick bread. Well... I'm having a camera dilemma, folks. I've just started taking a photography class and, of course, my autofocus decided to stop working after the first week of class. Not only that, but my manual focus isn't working so well either. It really stinks because I'm not going to be able to finish the class unless I go buy a new camera right away. Also, I'm not going to be able to take photos for the blog unless I buy a new camera or continue to spend tons of time to get an OK shot like the one above. I took it to a camera place and had my photography teacher look at it and was told that I would need to send it in to get fixed and it would take 4-6 weeks... boo... I had it cleaned and it didn't help. So, I'm not sure what I'm going to do yet. Any suggestions? The camera (Cannon T3i Rebel) is not quite 3 years old. But, anyways, I'm trying my best to take advantage of the class and get as decent of photos as I can for now. I'm looking forward to being able to do more with my camera once it's fixed or I have a new one. 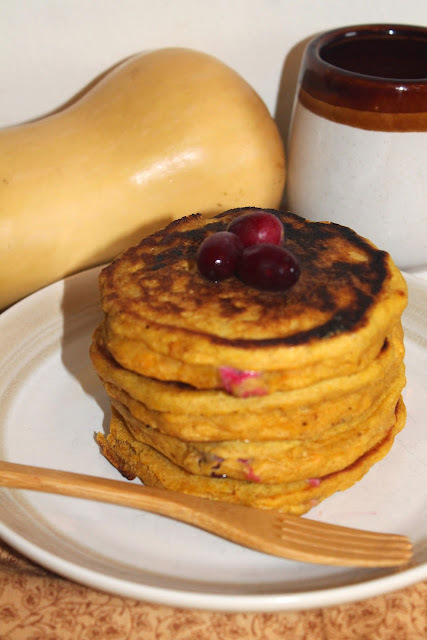 On a happier note, I made some very delicious seasonal butternut squash and cranberry pancakes for Week 3 of 12 Weeks of Winter Squash. 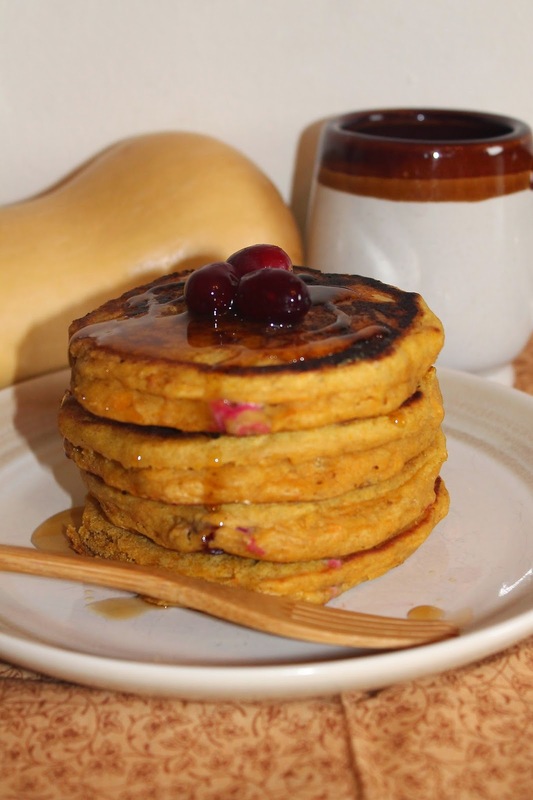 These pancakes are a modification of my pumpkin pancake recipe (ugh - talk about bad photos). I think these would be a great Thanksgiving morning or day after Thanksgiving breakfast - they are lightly spiced, a little sweet from the butternut squash (but no added sugar), and little bursts of tart/sour from the cranberries which all pairs nicely with a sweet maple syrup drizzle. I love turmeric, so I was very excited to see that Flavor of the Earth (who I partnered with before when trying out their real Ceylon cinnamon - this is now the only ground cinnamon I use) now sells organic turmeric. I love their cinnamon, so I was super excited to try the turmeric. I use this spice a lot in Indian dishes like Saag Paneer and Chana masala, and one of our favorite cold-weather drinks, spiced turmeric milk. We also use it to make these colorful and delicious turnip pickles. As I've mentioned before, we have tried to incorporate more turmeric into our diet for its health benefits. This turmeric is so fragrant, colorful, and flavorful. You can really smell and taste the freshness of the turmeric. Roasted chickpeas have been on my to-make list for quite sometime now. I thought the turmeric would go perfectly with them and I was correct. 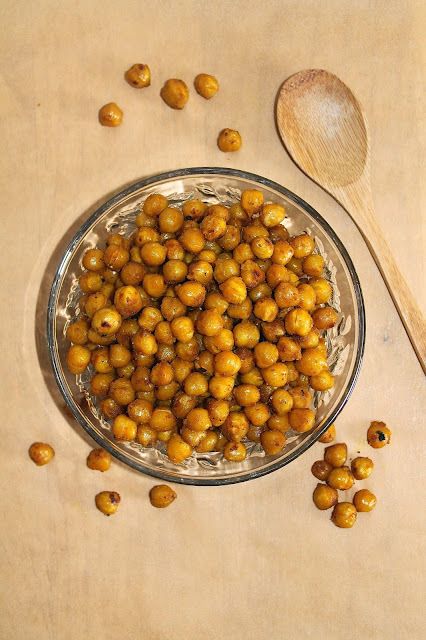 These little chickpeas are nutty, sweet, salty, and have a bit of spice - not to mention the lovely color they pick up from the turmeric (as always, be careful when using turmeric as it will stain). 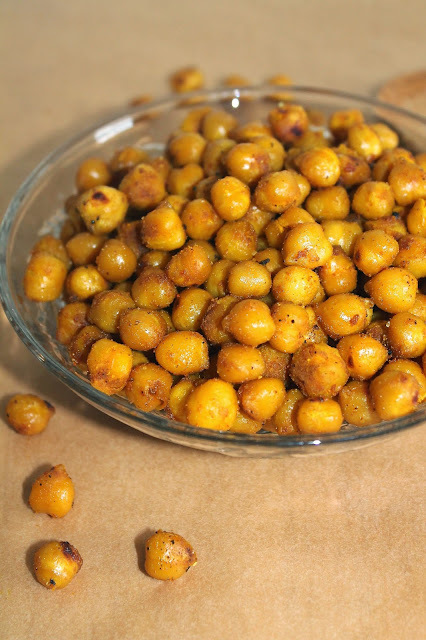 They make a great snack or appetizer before an Indian meal. 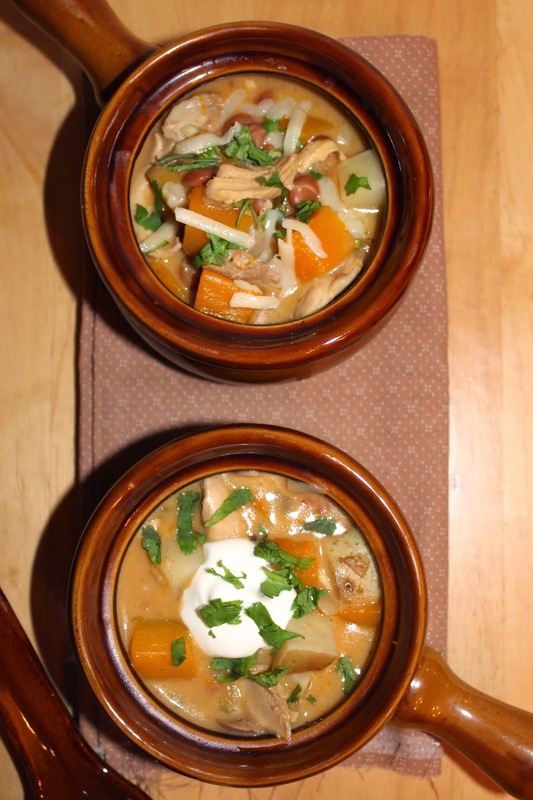 We ate them with this Chicken & Apple Indian curry. Caramel corn with peanuts (think like Cracker Jacks or Crunch n' Munch) was a favorite of mine when I was a kid. But, I can't recall eating it in many years. 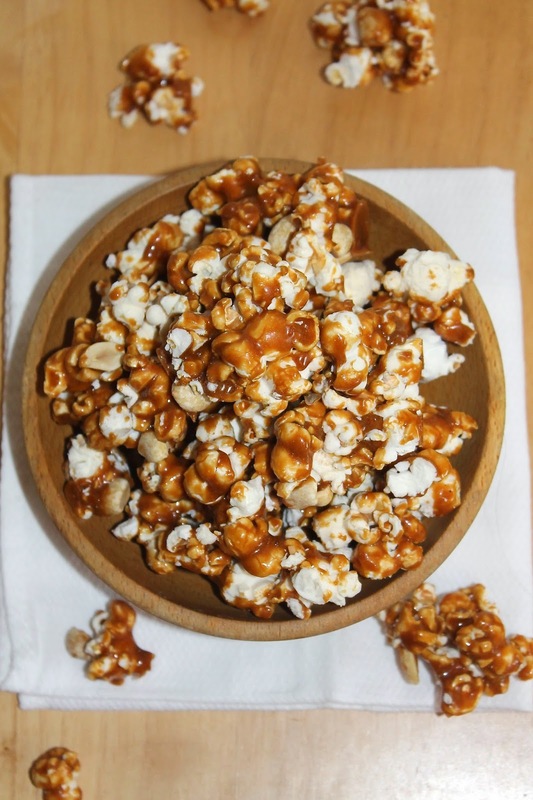 So, for an adult Halloween treat, I made us a batch popcorn coated in a caramel made with sea salt and honey and peanuts. It was delicious and went very nicely with a bottle of pumpkin ale. My husband and I may be in our 30s, but we still watch holiday specials and cartoons like Charlie Brown and Garfield. 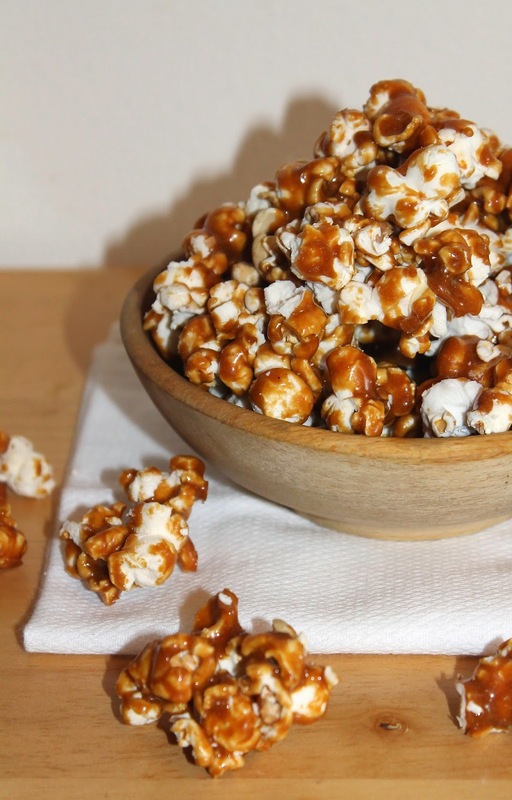 This popcorn needs to cool before you eat it so you need to plan ahead a little bit. In fact, it's better the next day because the caramel coating is crunchier and you can better taste the salt. So try to wait after you make it or plan to make it the day before you want it if you can. I'll warn you that it is quite addictive. I'm also thinking it could make a nice homemade holiday gift. I adapted this recipe from one over at Pineapple and Coconut. This recipe will make enough for about four people. Back in late September we bought a rather large blue hubbard squash at the farmers' market for only $2.00. This thing was pretty huge and, no lie, we've eaten it in about 10 meals already and it's not gone yet. This squash was definitely a great deal! If you haven't eaten blue hubbard squash before, please give it a try. It's very dense and very sweet - it's one of my favorites - it's even better than butternut, I swear (though butternut is also wonderful). I'm a huge fan of winter squashes and aside from that blue hubbard, we have a stash of all kinds in the basement. So, I'm excited to be participating in the 12 Weeks of Winter Squash blogger event again for the third year! Thanks to Heather from girlichef and Joanne from Eats Well With Others for hosting this fun event again. This event is open to any food bloggers who want to participate! 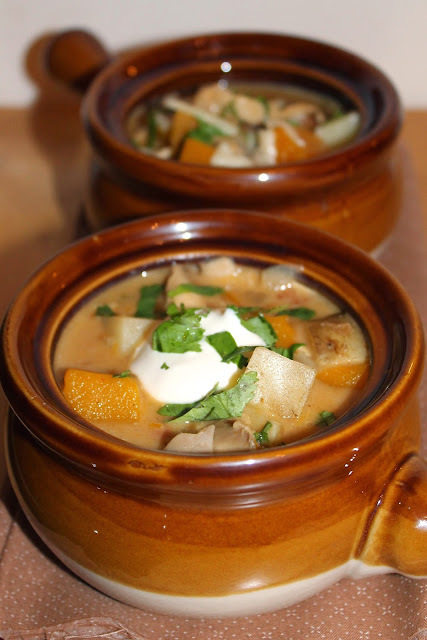 My first contribution this year is this soup that combines the sweet hubbard squash with chicken, pinto beans, and potato in a spicy and creamy broth (that also happens to contain some cheese). It's comfort food and perfect for a cold autumn evening.